Exchange A has 200M USDT on Omni network. They wish to move the bulk of this to TRON network to collect AirDrop interest. So they move 199M USDT to TRON network, leaving 1M USDT on Omni network. However, during the interest collection period, user A, who stored 1.8M USDT in Exchange A, decides to withdraw the entire amount. Since the exchange only left 1M USDT as reserve funds, they are thus short 800K in Omni USDT. Suppose Exchange A analyzes historical daily USDT withdrawal amounts for the past 6 months to 1 year. 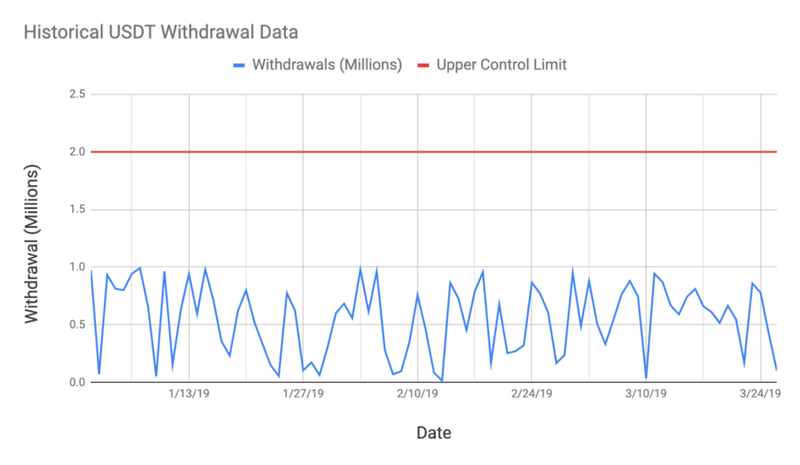 Suppose the data then shows a 6 sigma upper control limit of 2M USDT daily withdrawals. To keep a reserve fund that is sustainable for 2 weeks, Exchange A must then maintain [14M, 28M] in reserves. This means Exchange A can move 172M USDT over to the TRON network for interest collection and keep 28M USDT in reserves, in case of user withdrawal. If the 28M in reserves should dwindle down to 14M due to on-going withdrawals, then there should be a trigger to increase the amount back to 28M. Essentially, the upper and lower bounds of the reserve amount should be maintained at the 2 weeks and 1-week time frame, respectively. Exchange USDT Reserve Design Document was originally published in TRON on Medium, where people are continuing the conversation by highlighting and responding to this story.